Glass balustrade fencing adds a touch of class, glamour, and most importantly, safety to any staircase, balcony or outdoor space. Modern framing also means your glass balustrades will be completely invisible, allowing you to create seamless divisions between the areas of your home. 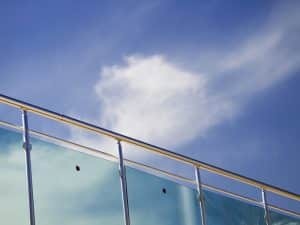 So, whether it’s for security, safety or style, glass balustrades are what you’ve been looking for. They are ideal for all types of homes. They will add that important drama and contrast to modern homes, while still being refined and elegant enough to fit into a more traditional design scheme. You can even customise the handrails as much as you like, so you’ll end up with a genuinely individual design piece. We’ve been manufacturing and installing glass balustrades for over 20-years. We love them because they last forever and require very little maintenance. We also design and build them ourselves, so we can vouch for their quality 100%, and you can customise every aspect of it, from the glass to the colour of the frame – the choice is yours with Everlast Services. Why Choose Everlast For Your Glass Balustrade Fencing? We’ve been in the industry for over 20 years, and that’s experience you can rely on. We have the expertise you need for a truly breathtaking glass balustrade fencing design. We’re a family operated business based out of Hopper’s Crossing. We’ve made our name on the back of excellent customer care, and you can expect nothing less from anyone that pulls on the Everlast uniform. The best part of our service is the fact that our steel frames are manufactured in-house. This gives us complete control over the entire process, and we carry out strict quality control on every stage of the fabrication. It doesn’t leave the factory until it’s perfect. We do a lot more than fencing. In fact, we can help you through every stage of your home improvement project, whether you need decking, concreting or landscaping we’ve got the skilled tradesman and quality products you need. Is glass balustrade fencing the perfect fit for your property? Contact us today to get started! You’ll love our quotes and our commitment to absolute quality.